I won’t even try to lie to you people. 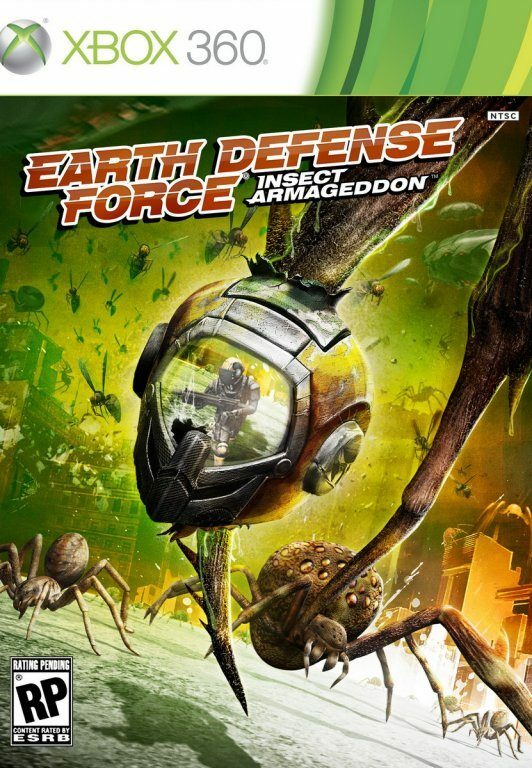 When I heard the loud thud that was the package containing Earth Defense Force: Insect Armageddon hitting my front door, I panicked. I’m pretty sure that I even cringed a bit as I opened the parcel. The box cover alone is something that, under normal circumstances, would have me looking the other way as it screams mediocrity. Good thing I was taught to not judge a book by its cover as I would have probably missed this fun little package. 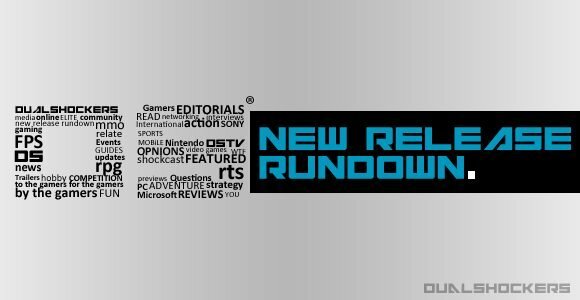 Usually, here at the site, we try to make sure that people handling reviews are familiar with the source material, especially when it comes to sequels. 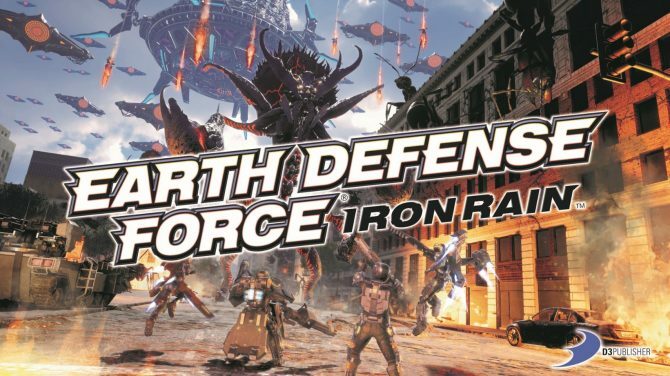 The fact that I didn’t have any previous experience with the EDF series should help provide a completely un-partial review as I played this game for what it was and not for what came before it. And it may be that very reason why I enjoyed this one. 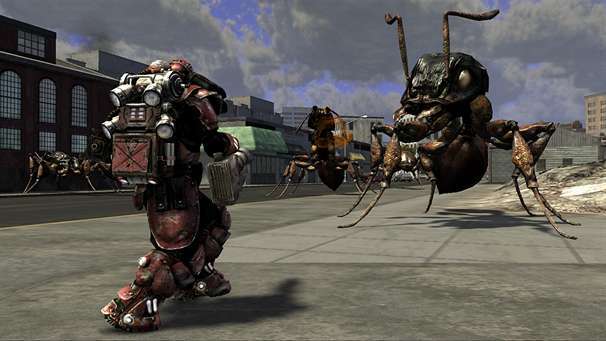 If someone were to ever request that I describe EDF in under five seconds or less, this is how I’d do it: Starship Troopers. Gears of War. Joe’s Apartment. The middle one there is self-explanatory, and the other two should point out that there are a whole lot of bugs and that they are very angry. 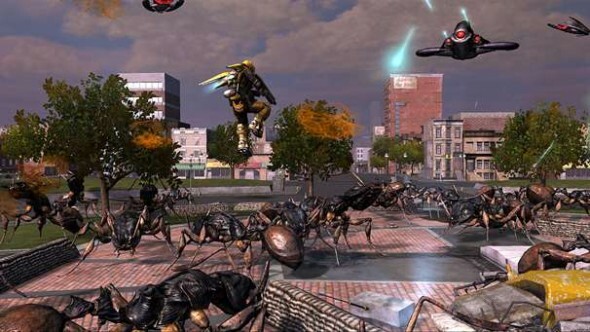 The game’s plot revolves around the alien invasion of “New Detroit.” The city has a serious bug problem and it’s becoming too much for its inhabitants. It’s time for the Earth Defense Force to come and well, you know the rest. Sure, it’s probably the most overused, cheesy action movie plot this side of Hollywood, but when it’s a game completely revolved around co-op and just plain ol’ fun, you’re really not playing it for the story anyway. When you first start it up, it’s pretty telling that this game is more of an arcade experience than anything else. It’s not a title that takes itself too seriously, because after all, what you’re essentially doing is taking down wave after wave of creepy crawler enemies. Sure, there’s variation thrown in there in the form of giant robots, giant buggy aliens, and giant alien airships, but, all in all, it’s much of the same. In the beginning of the game’s campaign, things are off to a pretty easy start. I mean I know that with this generation games have become especially easier (or accessible, depending on the developer you speak to), but this was just flat out easy — to the point that there was no effort on my end. All that changed within three hours and I was literally running for my life from the enemy UI that was pummeling me both on the ground and from the air. Visually the game is pretty average, and I think I understand why this is so. The thing is that a lot of the environments you see in-game aren’t exactly the most detailed out there, but when you realize just how much stuff is going on on-screen, then it’s easier to let a little of its shortcomings slide. Just when you think to yourself “damn, this looks bland” the building next you comes tumbling down to earth, and you think “oh right.” It’s touches like the collapsing buildings and the endless waves of enemies that make the game’s visuals somewhat acceptable. 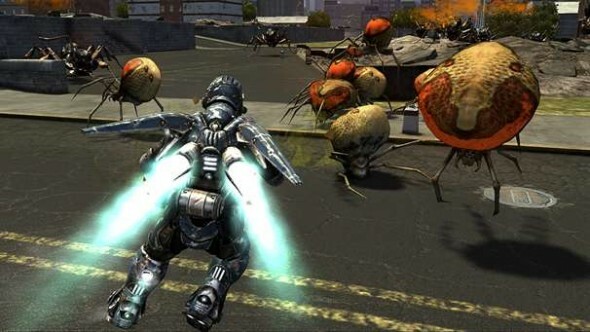 You can play co-op through the game’s campaign (which is, in my opinion, the ONLY right way to play this) either with a buddy on the couch next to you via split screen, or you can take the action online and add a friend for some bug killing. 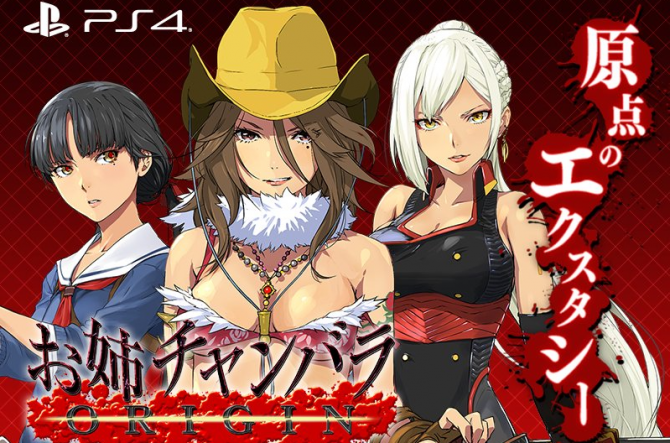 The campaign itself is actually pretty short, but with all of the different weapon combinations (over 300 according to the publisher) and classes, there’s reason to come back for more. Once the campaign fails to provide a challenge, you can get things a little more intense in the game’s survival mode where you’ll be able to play with six players total taking on wave after wave of enemies. The biggest annoyance in this one had to be the lack of real checkpoints. There would be times where I’d be literally half an hour into a chapter and fighting for my life only to get cheaply killed by the enemy and sent all the way back to the beginning of the level. At first I thought it was a serious development letdown, but when I realized how short the game actually was, I began thinking that it was just a cheap way to stretch out actual game time. Totally not cool. As I said earlier, when I realized that I was the one that was going to review this one, I was less than thrilled initially. Then after some time with the game and realizing that it does have some charm, I started to let my guard down. 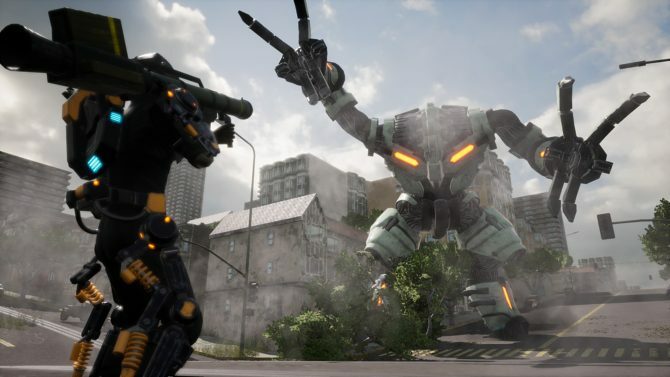 And it was a good thing too considering how fun EDF turned out to be. While it certainly is far from perfect, hell even buggy at times, at its core, Earth Defense Force: Insect Armageddon is definitely a fun ride, just make sure to bring your own buddy. Review Copy Info: A review copy for this title was provided to DualShockers, Inc. by the publisher for the purpose of this review.